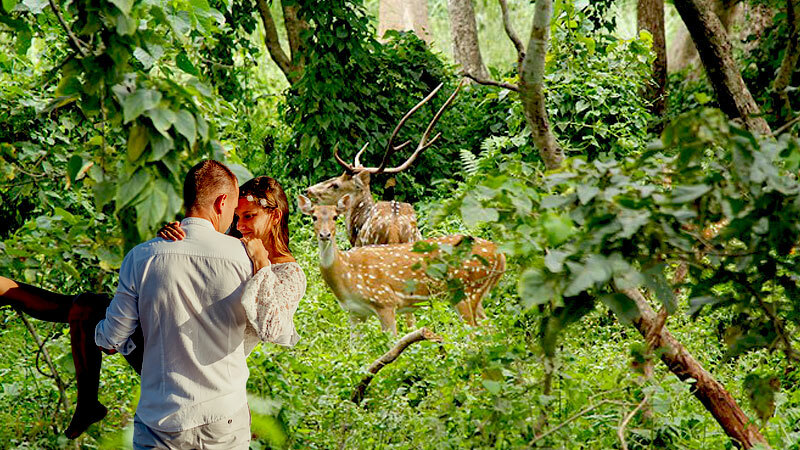 Enjoy your romantic honeymoon moment with Jungle Safari at Chitwan National Park and exploring natural beauties of Pokhara. Ride on the back of an elephant and see the wildlife inhabitants in the dense forest, mesmerize the ears with the pleasing songs of the birds, take a canoeing trip at the Rapti River, experience the natural jungle walk and much more at Chitwan. On the other hand, the natural beauty of Pokhara too makes your sensational visit more memorable one. The panoramic giant white peaks radiant on the Fewa Lake is the fantastic moment while boating on the Lake. As well as taking a blessing from the spiritual god and goddess of the town turns your marriage life successful and prosperous. Our Chitwan Pokhara Honeymoon Tour journey commences with a scenic drive from Kathmandu to Chitwan. Chitwan is popular for its Jungle Safari which is listed in the UNESCO Natural World Heritage Sites as well. It is the must-visit place once in the lifetime. Here, you will be participating in Elephant Back Safari, Canoeing trip, Jungle Walk, Elephant Breeding Center Visit, Tharu Village Visit, and Cultural Stick Dance Show. Completing the safari you will be transferred to another most famous tourist destination of Nepal, Pokhara. Sunrise view from Sarangkot, panoramic mountain views, visiting important temples, caves, waterfalls, and boating at Lakes are the incredible activities here. You will be received by our airport representative then he will be assisting you to transfer to your hotel. Meet guide and a brief introduction to the whole program. Overnight at Kathmandu. Day 02: Drive to Chitwan. You will be picked up from your hotel early morning and prepare for the trip. A brief introduction to the whole program and drive to Sauraha. It is 175 km far from Kathmandu and takes around 6 hours. After arrival, you will be transferred to the resort and hotel check-in. The nature guide will be briefing you about the activities. Take lunch at the resort and proceed to Elephant Safari. In the evening, enjoy the Tharu Cultural Dance Show. Overnight at Chitwan. Day 03: Chitwan Jungle Activities. Today's activities will be canoeing trip at Rapti river, jungle walks, elephant breeding center visit, and Tharu Village visit. Breakfast, lunch, and dinner at the hotel. Overnight at Chitwan. Day 04: Drive to Pokhara. Begins the morning with hot breakfast. Drive Chitwan to Pokhara. Pokhara is 160 km far from Kathmandu and takes around 5/6 hours. Arrival at Pokhara and hotel check-in. Free time and overnight at Pokhara. Day 05: Pokhara Sightseeing Tour. The first and stunning attraction of Pokhara sunrise view from Sarangkot. Drive to the north of the city at Sarangkot. View the sun rising and the golden lights sparkling over the towering mountains. Back to hotel and after short rest proceed to visit other popular attraction of the city. Visit Bindabasini Temple, Seti George River, Mahendra Cave, Bats Cave, International Mountain Museum, Gupteshwor Mahadev Cave, Devi's Fall, and Barahi Temple with boating at Fewa Lake. Free time and overnight at Pokhara. Visit International World Peace Pagoda at the top of the hill to the south of Pokhara Valley. Back to the hotel and after short rest drive back to Kathmandu following the same route. Arrival at Kathmandu and transfer to the hotel. Free time and overnight at Pokhara. Day 07: Kathmandu Sightseeing Tour. Morning participates in the breathtaking one-hour mount Everest view flight. Early morning transfer to the airport and perform the adventurous mountain view flight. The flight provides a marvelous opportunity to observe the worlds' tallest mountain Mount Everest as well as other neighboring Himalayas. Back to the hotel and refresh. Then, proceed to visit the UNESCO World Heritage Sites around the valley. Visit Pashupatinath Temple (the biggest Hindu Temple), Bouddhanath Stupa (the biggest Stupa), Swoyambhunath Temple (also known as Monkey Temple), and Kathmandu Durbar Square. Take breakfast and you will have free time until 12 noon (hotel check out time). Then, transfer to the international airport for your onward destination. The time has come to say goodbye and bring the beautiful memories with you. Pokhara Nepal Honeymoon Tour Trip finished here! Kathmandu Airport picks up and drops by private vehicle. Twin Bed sharing (2-5 star) hotel accommodation at Kathmandu, Chitwan, and Pokhara. Kathmandu to Chitwan to Pokhara and back by private vehicle. Everyday breakfast at the hotel. Kathmandu and Pokhara Sightseeing by private vehicle. All the tour will be escorted by an English speaking guide. Entrance/Monument Fees during sightseeing at Kathmandu and Pokhara. Everyday breakfast, lunch, and dinner at Chitwan. All the activities as mentioned in the itinerary. Park permits, and entry fees at Chitwan. Bar Bills like Minera Water, Beer, Whiskey etc. Lunch, and dinner at Kathmandu and Pokhara. Rest of all that are not mentioned in cost includes. Wants some modification on Chitwan Pokhara Honeymoon Tour itinerary? contact us to customize it. Email will be kept private. Sign up to receive latest news, updates, tour packages departures and offers via email. We'll never share your email with anyone else. Your number will be kept private. Just drop us your name and number so that one of our team member can contact you. All the content of this site belongs to Yatri Nepal Adventure Pvt. Ltd located at Jyatha, Thamel, Kathmandu, Nepal. Our Office contact number is (+977) 01 4226237. In case of any emergency assistance feel free to call in mobile no. (+977) 9851159806 or drop us an email at info@yatrinepal.com or view the contact page for more options. Offered Nepal trekking tour packages in this site can be adjusted as per clients necessity. Our content is focused on providing the best possible information to the visitors about the various tourist attraction places of Nepal, means to reach there, available accommodation and best season to travel so that they can plan their holiday appropriately and explore Nepal with ease. Booking package trip with us are subject to availability with terms and conditions. You can read more details on our booking terms and condition page. All the visitors are requested to consider the above-written information for their travel guidance reason. Copying and re-creating wholly or part is strictly prohibited unless written permission from the company. If you are getting any trouble in browsing our site or doesn't find the best Nepal tour packages or itinerary then, please inbox your query at info@yatrinepal.com. We respect all the inquiry and will be responded within 24 hours.